Designing public spaces to be enjoyable, safe and environmentally sustainable might seem like a tall order, but transforming underused spaces into well used places using 3D design, lighting and artworks is what Crieff-based Bigg Design does best. Bigg Design studio founder Hamish Bigg has worked on a number of innovative light and art based projects which improve the built environment, from the The Helix park and ‘Kelpies’ in Falkirk, to historic churches, office buildings, bridges and urban underpasses. Underpasses are crucial walkways for pedestrians, yet they can be very unwelcoming, uninspiring and unsafe places, particularly at night. 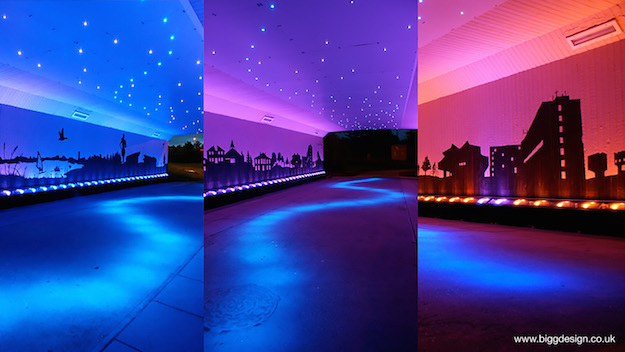 In 2011 Bigg Design worked on an award-winning commission for North Lanarkshire Council which regenerated an underpass in Cumbernauld with stunning lighting and mural designs. Local school pupils use this underpass on a daily basis, so the team worked with pupils and the broader community to develop a mural featuring scenes which celebrated the local area and includes a mix of people, parks, wildlife, and architecture. The LED lighting gradually changes colour over the evening, symbolising the transition from dusk until dawn. Conserving energy usage is a particular priority for public spaces – by using innovative technology this large underpass now only consumes the equivalent of 6 typical domestic incandescent light bulbs when illuminated. As the community were involved throughout the development process, it’s ensured that they have a sense of local ownership and the underpass has remained a graffiti-free zone even a few years on. 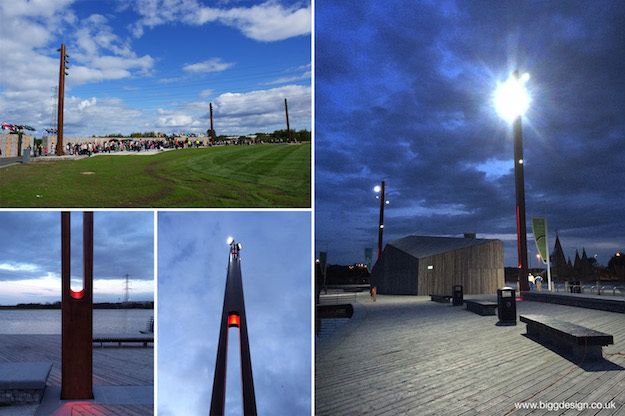 Working on high profile projects such as The Helix, Hamish worked with Lightfolio to design a series of feature light masts to define and enhance the outdoor performance area of the Central Park and the Lagoon space. 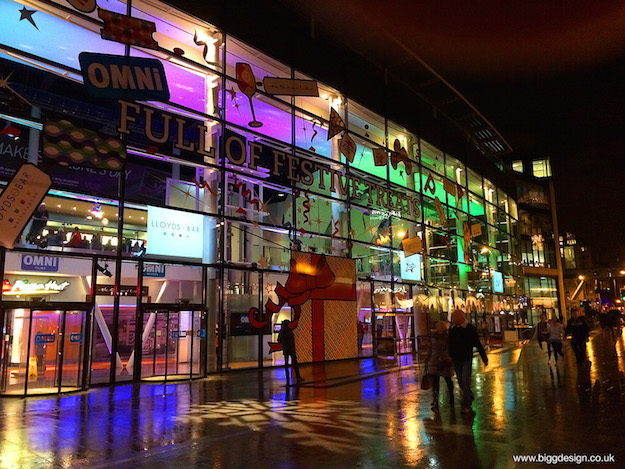 The bespoke engineered-wood masts carry highly sophisticated wireless-controlled floodlights and colour-change lighting which can be set up for any type of occasion. 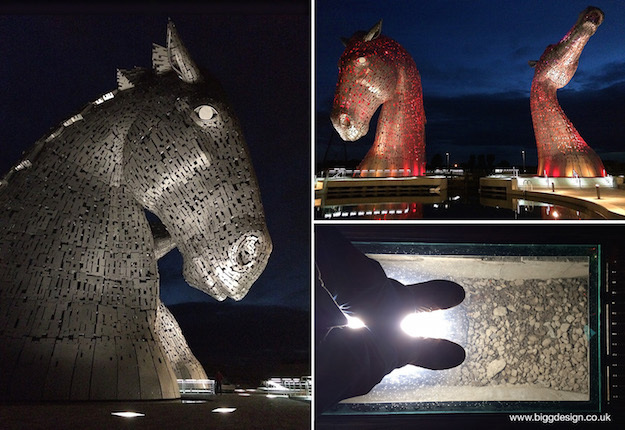 As part of the same development, Bigg Design also assisted Lightfolio to design specialist walk-over-glass lighting pits which have allowed the gigantic sculptures ‘The Kelpies’ to be illuminated so dramatically at night. 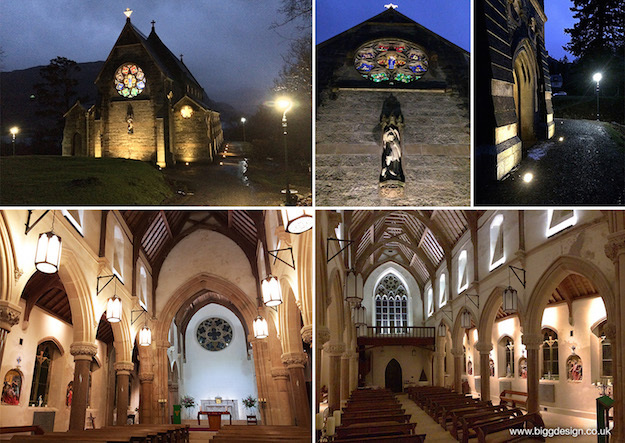 The historic Glenfinnan Church project with LEDTEK used LED lighting and bespoke lanterns to highlight its beautiful architectural features and can now be transformed literally with the flick of a light switch. It has enabled the church to consider using the space in different ways and has cut it’s lighting running costs by 90%. Graduating from Glasgow School of Art in 2008 with a Product Design degree, Hamish has also developed a number of innovative furniture pieces and graphical works. As Hamish travels all over the country, he believes Crieff is a great base as it’s given him the freedom to move out of the city whilst still being within easy reach of many of Scotland’s commercial centres. Among the projects Bigg Design is currently working on is a busy central London underpass where Hamish aims to make it a fun and pleasurable experience to use, challenging our assumptions of underground walkways by encouraging people to stop and enjoy the experience rather than hastily walking by. Come in – We’re Open!